Michelle from Zibibo contacted me recently to congratulate me on my pregnancy and to offer me the chance to try out some of their maternity clothes. I ended up picking this bubble tank for work and a maxi dress for weekend wear. I honestly don't think I will be packing this top away even after baby arrives! As well as being a nursing tank, it's extremely comfortable, and I like the navy shade. It's definitely something I will be keeping and wearing long after baby grows. It's made from bamboo and cotton, so it's really soft. When I placed the order at Zibibo, it arrived really quickly as they sent it express - a great shipping option for those feeling like they are running out of bump friendly things to wear! The packaging was beautiful also. Everything was wrapped in tissue paper, with a cute little sachet of popurri so the parcel smelt lovely. Even with my sensitive pregnancy sense of smell I liked it. And I've been so picky over smells I've given up on using all the previously wonderful scented candles I own! The top is beautiful, the dress is gorgeous (look out for an upcoming post! ), and the absolute best thing is that they included a little package of gourmet marshmallows with my order. I spent a lot of my first trimester craving after and stuffing my face with marshmallows, so they certainly know the way to a pregnant lady's heart! They were delicious. I always enjoy getting extra little surprises in parcels, don't you? Especially edible surprises! Last worn: Wittner black flats, Balenciaga tempete Day bag. First time I've worn the skirt and top. 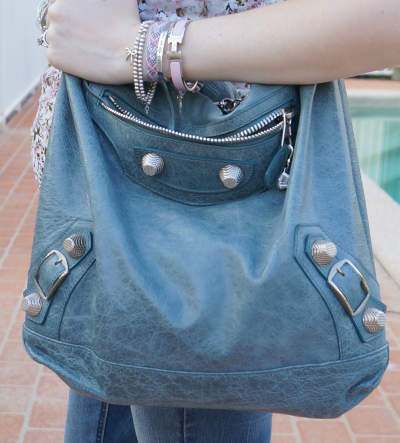 Carrying my Balenciaga day bag again! 3 days in a row now. It's just such an easy and comfortable option, I haven't felt like changing it out for another bag. It's been a tough week so I've been gravitating towards blue accessories to cheer myself up a bit. 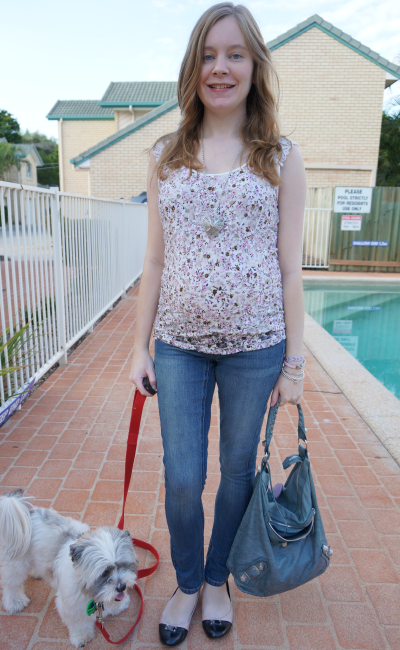 Last worn: floral and lace top, Jeanswest maternity skinny jeans, cap toe flats, Balenciaga Day bag (see above). Linking up with Fashion Item Friday, Friday's Fab Favourites, Totally awesome blog hop, Casual Friday today. Awww you are so cute! That skirt is really really pretty!!! And also the top you have matched to the jeans is wonderful! your new skirt is so adorable! i've never really gotten a surprise in a package before! marshmellows, potpourri and beautiful wrapping sounds amazing. That navy top is so versatile! I love that you can wear it after pregnancy, too. It's so cute paired with your skirt. Can't wait to see your maxi dress from them! Hy my dear! You look gorgeous! Hope you and the baby are doing well! That was so sweet of them! Love the top and look at you with that skirt...sexyyyy! HaHaHa You look great Mica. Have a wonderful weekend doll. I love how your new top looks with the striped mini - just an adorable combination! Looking great mica! Day bags are such a good size and shape, I love mine to bits! Tempete is such a nice colour too, I love that silver hardware. I love that skirt you wore with the bubble tank, and of course I always love seeing your pup! I love that you take pictures with your dog - I have soooo many cat pictures, but none of my cats have ever been well-behaved enough to sit still! Hi Mica, I love to see the bump grow :) you're a modern mommie. Beautiful looks! Stopping by to say hi! Keep in touch! Love the navy tank with stripes! Wonderful outfit and how lucky are you!